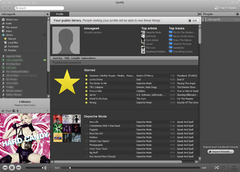 "Free streaming music via internet on your desktop"
Spotify is a simple program that you install on your laptop or desktop computer that allows you to listen to streaming music for free. The program runs on your computer and uses your internet connection to access the millions upon millions of songs stored in the Spotify servers. Unlike other music streaming services, you don’t have to have Spotify open in a browser window for it to work because it runs as a separate program, and unlike torrent programs, everything is 100% safe and legal. You’ll never have to download music again. The basic version of Spotify pays for the rights to the songs you listen to by playing a short advertisement periodically. If you prefer an ad-free version, you can purchase a premium subscription. At its core, Spotify is as much a social app as it is a music streaming program. You can link it with your social media accounts to let your friends know what you’re listening to, create playlists and share them with your friends. Then, return the favor and follow your friends’ playlists back. Spotify offers song recommendations and is a great way to discover new music, no matter what your tastes are.